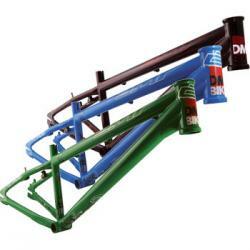 This is a heavier duty frame, aimed at the more aggressive rider. It is made from oversize heat treated 4130 Cro-Mo tubing for extra strength, has geometry to suit the Trailblade 2 fork or a short travel Mtb fork, integrated headtube for (45/45 headset) and a head angle of 72' for quick, precise handling. It also has APS mounts, I.S. disc mounts, 6mm dropouts which take a 14mm axle hub like the DMR Revolver 14mm single speed hub, 10mm axle adapters, Chain Tugs and horizontal drop-outs which allow adjustments of the wheelbase to suit.